Followed up my first lunch visit with several dinner outings, including two very satisfying meals grilled with their charcoal bbq. Fantastic use of the rotating grill, that functions as a quasi-table heater in these colder days. The cooking device reminded me of the kind I had once in a restaurant in the Kangnam district of Seoul. Best to call ahead and reserve this as it takes them thirty minutes to have the hot bricks ready. Great for larger parties. The accompanying Korean miso soup is excellent as well. On another visit, had the daegutang (spicy cod soup), a mouth watering dish, loaded with vegetables, making it a very well balanced meal in itself. Discovered they join a select list of places that offer tangsuyuk (pictured in the bottom row of the above set) which I described in a previous post as usually being “a mixture of red peppers, onions and crispy deep fried pieces of pork, all coated in a sweet, and slightly sour sauce”. Unfortunately, theirs is not as crispy as I like. As well, they have the savory noodles better known as jajangmyeon. Unfortunately, this was a disappointment as well – Dae Bak Bong Ga downtown does it way better. The kalbi was okay, marination was fine. I guess I just prefer to grill mine on my own at the table. For an order of one though, not possible. I was inspired by this post. Also due to the fact that two separate planned trips of mine to South Africa in recent years have been nixed at the last moment, I was feeling like I had to get a taste of some food from that part of the world to get over the bitterness. Safari Gourmet Pies is a bit tricky to find. South a few blocks from busy Kingsway, and nestled amid many automotive-related businesses and shops, is their storefront and production facility. It is associated with a trading company that imports good from South Africa as well next door. On my visit, their shelves were a bit sparse, with the kind proprietor Pam telling me they were expecting shipments again soon. In November, Rasoee set up shop in a former video rental store space. Its a quick and easy, mainly take away franchise chain with origins in Toronto. Over the last seven years, it has expanded to other cities out east (Burlington, ON), as well as out here in the western provinces (Calgary, Edmonton, Whistler and Vancouver). This particular location has a very small counter where you could eat your meal in-house so to speak. This is just a hunch but I have this feeling that right up there with posts on sushi, pizza is a very close second here on foodosophy. Both in terms of the number of entries and also the variety of locations that its been consumed by our writing staff. 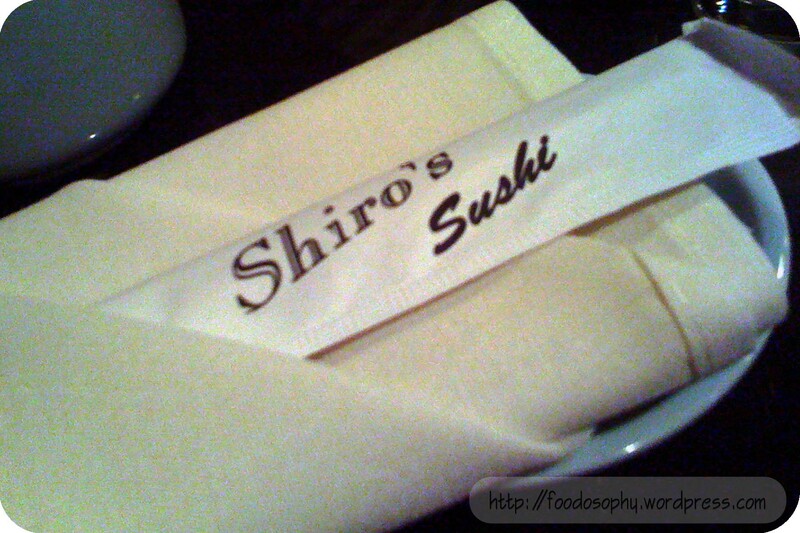 I have had Shiro’s Sushi Restaurant on my wishlist for a few years, ever since I learned about the master-student relationship between Japan’s revered sushi master Jiro Ono, and Shiro Kashiba. When I recently found myself on a short notice trip to Seattle, I was elated to learn that we scored a dinner reservation. Unfortunately Kashiba-san was out of town, so we were at the mercy of his deshi. The many reviews out there, state that the best seat in the house is at the sushi bar (which was full), so we opted for the Kaiseki dinner to give us an opportunity to try a variety of dishes. With three price-points to choose from, we went with the $80 middle option. We begin with a trio of appetizers: tempura of king salmon wrapped with smelt, asparagus with a miso dressing, and yellowtail collar. At first glance, I thought we were given a fried salmon roll, but the tempura of two variety of fish with a squeeze of lemon made this the stand-out of the trio.